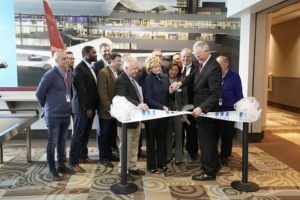 NASHVILLE – The Metropolitan Nashville Airport Authority (MNAA) staff and Board of Commissioners today held a ribbon-cutting ceremony for the opening of Nashville International Airport’s (BNA) expanded and upgraded interim International Arrivals Building (IAB). The milestone event marked the first project to be completed under BNA Vision, MNAA’s dynamic growth and expansion plan for Nashville International Airport. BNA Vision will include the construction of a larger state-of-the-art International Arrivals Facility (IAF), which is slated to open in 2023. To accommodate immediate needs for additional international capacity, the current IAB has undergone $8.2 million in improvements to serve as an interim international passenger processing and welcome center while the permanent IAF is being designed and constructed. The interim IAB will accommodate immediate needs for additional international capacity, specifically with British Airways’ new nonstop service from BNA to London’s Heathrow Airport five days a week, beginning May 4, 2018. This new service adds to international destinations travelers can currently fly nonstop via BNA including Calgary, Cancun, Cozumel, Grand Bahama Island, Montego Bay, Punta Cana and Toronto. A new, direct connection between the interim IAB and the baggage claim, eliminating the need to re-check baggage or be re-screened by the Transportation Security Administration, unless transferring to a domestic flight. Construction on the interim IAB project began in May 2017 and concluded at the end of February 2018. As a result of the upgrades and improvements, BNA’s processing capacity for international arrivals has increased from 200 passengers per hour to 400 passengers per hour. BNA is currently served by 13 airlines and offers 450 daily flights. Nashville International Airport provides nonstop air service to more than 60 destinations.